Our St Clare 10k saw record-breaking numbers with 400 racers! A total of 398 athletes took part in St Clare Hospice’s 10k 2019 race on Sunday (7th April). The annual charity 10k race, which celebrated its 25th anniversary this year, is a permanent fixture in Essex running club calendars and attracts competitors from across the county. This year’s event is expected to raise £15,000 in vital funding for the Hospice. The participants, including seven wheelchair athletes, set off from the Hastingwood-based hospice at 10.30am, tackling a route along roads through the beautiful Essex countryside. 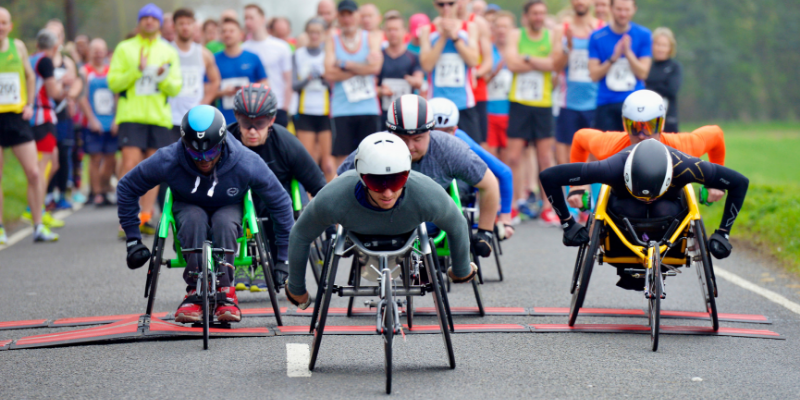 T54 GB Paralympian and Harlow Athletics Club wheelchair athlete coach, Richard Chiassaro, was the first wheelchair competitor across the finish line in a time of 25 mins 2 secs. The first man back was Martin Westley from Harlow Running Club, in a time of 35 mins 49 secs. He was closely followed by Greg Tye (35:49) of Braintree & District Athletic Club, and Steven Prosser (36:00) of Bishop’s Stortford Running Club. Victoria Stacey took first place in the female category in a time of 39 mins 53 secs. Second place went to Vicky Simpson (43:41) from Bishop’s Stortford Running Club, with Georgina Warren (44:54) from Woodford Green Athletics Club in third. Special thanks go to all the volunteers who marshalled the route and helped on site. View the full set of photos on our Facebook page, here!